Here's where to watch every episode of The Flying Doctors season 3. Mouseover or tap an episode to see where to stream it. Click or tap the play icon to stream it on the best available service. Cries from the Heart Mar 17, 1988 The pub's hawaiian night is put on hold as a search is launched for a missing child involved in an accident in the bush. A local woman claims to have seen the child, Jack doubts this, but is plagued by guilt that he might have made the wrong call. 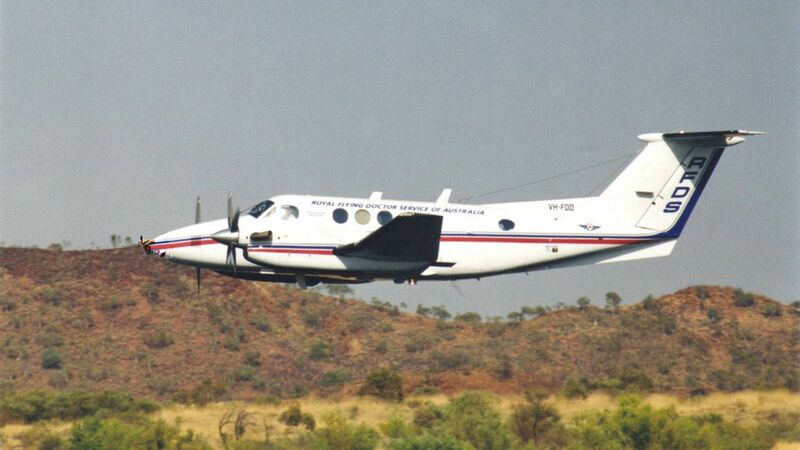 All in a Day's Work Mar 24, 1988 It's inspection day and what starts as a routine schedule for RFDS crew soon turns into pandemonium as a series of emergency calls come in. With everyone too busy to give the inspector more than a nod, what will she make of the way Coopers Crossing handles their "Routine" day? Out of a Clear Blue Sky Mar 31, 1988 A travelling salesman makes a visit to Coopers Crossing. He is an alcoholic and Chris has tried to help him in the past, but realises there is little she can do but be his friend. Marty the mechanic arrives in town but soon causes trouble for DJ at the disco. Affirmative Action Apr 7, 1988 Sam and Emma come to the aid of a friend who has entered "The Great Australian Camel Race", and George Baxter finds himself besieged after incurring the wrath of the town's womemfolk. Figures in a Landscape Apr 14, 1988 An artist and his agent arrive in town to find a bush retreat to boost his flagging career, but is the visit just a cover for something more sinister? Meanwhile, Chris finally confronts Jack about their relationship. The Devil You Know Apr 21, 1988 George Baxter meets his match when his tough American woman boss comes to town and doesn't beat around the business bush. DJ's budding affection with Soula is in danger of being discovered when they both catch chicken pox. Operating Solo Apr 28, 1988 An explosion at a gas field injures Geoff, and Kate accompanies him for therapy at Broken Hill - will romance blossom? Chris has to perform an emergency operation, and DJ has to win back Soula's affections. The Path of True Love May 5, 1988 The RFDS come to the aid of a tourist bus stranded by a flood. One of the passengers is seriously ill, and it looks as if she will die alone until a 25-year old love affair is rekindled. DJ himself has some affairs of the heart to resolve. The Kid May 19, 1988 A young boy and his dog arrive in town, expecting to compete in the local sheep dog trials. Marty suspects him to be a runaway and takes him under his wing, but the boys' presence creates tension in the community. The First Step May 26, 1988 Geoff has to be cruel to be kind to help a young woman recuperate from a stroke, while for DJ, woo turns to woe when his courtship of Soula runs into an unexpected obstacle. Hopscotch Jun 2, 1988 When a young, pennyless woman expecting her third baby is deserted by her husband, the town's sympathy is aroused and donations of money, clothing and toys flood in. However not all is as it seems as the folk of Coopers Crossing soon discover. Jacks High Jun 9, 1988 Things look nasty in Coopers Crossing when the town is invaded by a wild bunch of shearers and Jack is accidentally shot. Will the town be able to find somebody with his rare blood group in time? Clapped Out Jun 16, 1988 The RFDS come to the rescue of two old timers trying to save their heritage from the rapacious George Baxter. Wedlock Jun 30, 1988 A boy finds out his mother is having an affair with another landowner. The boy falls off his horse and complains of pain in his legs. chris can find nothing wrong with the boy and suggests he go home. He hears his parents talking of divorce and falls ill again. Sam and Chris devise a way to find out if he is faking or not. Marty is forever talking about leaving for Surfer's Paradise so DJ, Constable O'Connor and Sam set up the Surfer's Carnival. The Wrangler's Daughter Jul 7, 1988 A Wrangler and his mental impaired daughter are camping out in the bush. The wrangler's boss Richard Sawyer frightens the girl who runs away, and when her father goes looking for her he is bitten by a snake. The locals start a search of the bush and Constable O'Connor impresses the town by finding the girl. Borrowed Time Jul 14, 1988 A crop duster friend of Sam's named Bob gets work for Baxter but he has turned into a Enviromentalist and sprays water/milk over the crops. Baxter is not impressed and wants Constable O'Connor to arrest him. Bob tells Sam about his 8yr old son being killed when he sprayed himself with chemical from a tank. Bob decides to make a statement by threatening to empty chemicals into Canberra's water supply. bob gets killed and Sam finds out there were no chemicals aboard his plane. The Forbidden Jul 21, 1988 A land inspector visits falls down a cave after being warned by an aboriginal spirit to stay away. He is rescued but becomes very ill. Geoff asks Dougie for help in getting the curse removed. The man recovers but his tests show he had a disease caused by bat droppings. Mike visits Chris and brings his two daughters with him. The whole town starts talking about Chris, so Mike leaves but states he will be back. Sam's sister, Paula, also comes to the Crossing, she's got a job as radiographer at the hospital. She'll Be Right Jul 28, 1988 Hurtle returns to the crossing driving a Rolls Royce, which is stolen, but he doesn't know. Constable O'Connor is advised to look out for the stolen car, so Hurtle and Vic start hiding it around the town. Jack returns and he finds out Hurtle and Vic are upto no good. Mike tells Chris he has asked his wife for a divorce, but receives a call saying his wife has taken the children back to France. he asks Chris to go with him but she refuses. Mike leaves, and Chris is left to cry on Jack's shoulder. One Final Request Aug 4, 1988 Mike has left his Tiger Moth plane to Chris, after going to France to his kids. Geoff and Kate comes to and old lady with a heart condition. Geoff wants to put her in hospital, but she wants to die in peace, on her property. Geoff and Kate decides to stay and make her last hours as comfortable as possible. They also conduct the funural later on. Vic and Hurtle's case comes to court, and thanks to Larry, everybody involved get off with a warning. In the end, Larry and Hurtle both leave town. Roxanne Aug 11, 1988 Emma is going out to fix a tractor, despite Sam's and Paula's protests. On the road she sees a car in trouble. Inside she finds Roxanne and Kenny, both on the run from the police after a robbery. Kenny has been shot and is in a dreadful state. Roxanne forces Emma, under gunpoint, to ditch their car, and drive them to an abandonned shed in the bush. Late at night Kenny gets worse, so Emma and Roxanne go into town and get Chris. Sam has already reported Emma missing, but no one misses Chris until the following morning. A searcparty is organised and finally they find Chris and Emma, who has been under a lot of strain, since Roxanne has been taking amfetamines. No Way Back Aug 25, 1988 Emma is visiting a lady called Ann Williams on a farm outside of town. George Baxter wants to buy the property, but Ann doesn't want to sell, she has too many memories from the farm, where she lost her child a few years back. While Emma is out there, Sam visits, and suddenly Emma get a horrible stomach pain. She realizes there's something wrong with the baby, and George Baxter, who is in the neighbourhood, offers to give her and Sam a lift to the hospital. When they arrive in Coopers Crossing, Emma has lost her baby. Emma seem to recover, but an argument with Sam reveals she's really feeling terrible. Ann has decided to sell the property and go into the city. She doesn't want George to get a cheep price so she keeps an auction. The property is sold...to Sam Patterson!! Geoff finally agrees to go flying with Chris in her Tiger Moth. He is terrifid...but he survives! Johnnie Come Home Sep 1, 1988 A man named Harry has inherited a kidneydisease from his father and needs a new kidney. The only one who might be able to give it to him is his brother Johnnie, but he disappeared in Vietnam during the war. Harry's father dies and at the funural his wife Julia sees Johnnie, but Harry doesn't her. When Johnnie ends up in hospital, it turns out Julia was right, it is Johnnie! He gives his kidney to Harry! Look, Up in the Sky Sep 8, 1988 A couple of air balloons drop in on the clinic run. As the Nomad is in for some expensive repairs, a balloon race is organised in order to help raise dome funds. Kate and Geoff compete in different balloons but things do not run according to plan afterone of the other competitors develops a hernia mid-flight.